SUPPORTING THEIR COACH – Whitehorse Glacier Bears swimmers hold signs at the CGC pool on Friday calling for the board to reinstate their coach Malwina Bukszowana. 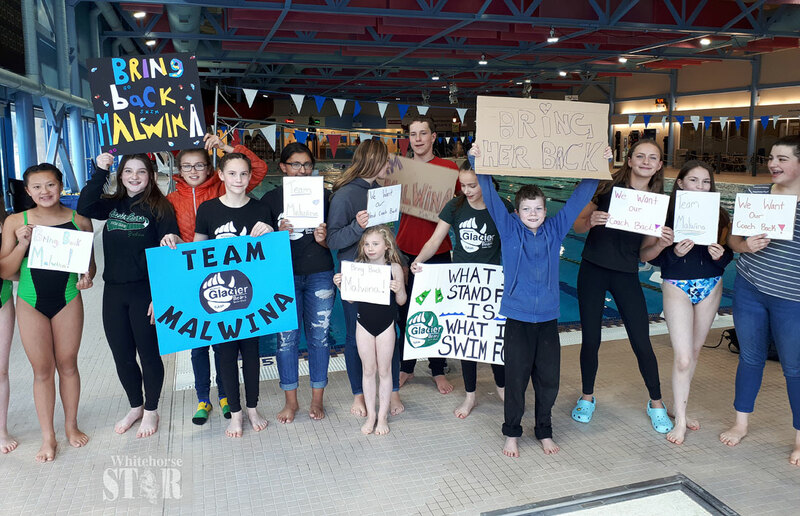 On Thursday, some Whitehorse Glacier Bears swimmers took to the deck of the Canada Games Centre pool holding signs that said: “Bring Malwina Back.” On Friday, a large contingent of the swimmers was once again on the deck of the pool calling for their coach, Malwina Bukszowana. The parents were not granted that emergency meeting and the details surrounding Bukszowana departure are still unclear. What is clear is that the swimmers would like their coach back. This is what they had to say. Mannen said Bukszowana was a tough coach but she made everybody improve. “If you want to work with kids and be a coach you have to be strong-willed,” said Mannen. Other swimmers echoed the same sentiment as Mannen. “She always pushed you out of your comfort zone and made you want to be your best,” said Amelia Ford. Some of the swimmers had a message for Bukszowana. “Most of the swimmers want her back and that she means a lot to a lot of people,” said Khushi Brar. The swim season is coming to an end with swimmers about to head to their final meets. “It’s not going to be the same competing without her,” said Mannen. “I was really hoping for her take me to the Western Canada Summer Games,” said Berrault. “It would be a lot better to have her than not,” said Thomas Gishler. The swimmers believed that the board has heard their message.